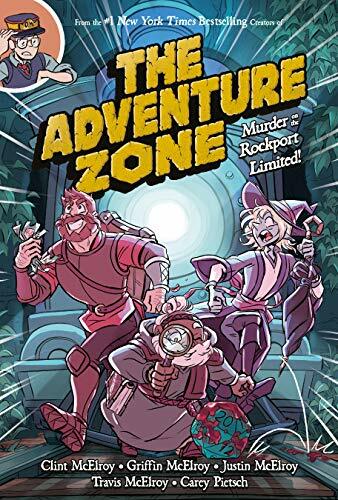 In the second Adventure Zone graphic novel (adapted from the McElroy family's wildly popular D&amp;D podcast), we rejoin hero-adjacent sort-of-comrades-in-arms Taako, Magnus, and Merle on a wild careen through a D&amp;D railroad murder mystery. This installment has a little of everything: a genius child detective, an axe-wielding professional wrestler, a surly wizard, cursed magical artifacts, and a pair of meat monsters. You know, the usual things you find on a train. Hot on the heels of The Adventure Zone: Here There Be Gerblins, the smash hit graphic novel that launched the series, The Adventure Zone: Murder on the Rockport Limited picks up the saga where volume 1 left off. Both books are based on "The Adventure Zone," a tabletop RPG comedy podcast with downloads numbering in the tens of millions and an army of passionately devoted fans. With art and co-adaptation from Carey Pietsch, the McElroys are once again turning their raucous freewheeling D&amp;D campaign into some damn fine comics.